Hello Comrades, 13th Guards calling. Over! You can also contact us on the Northern World War Two Association Forum pages at: www.nww2a.org.uk and also be able to access our site on the NWW2A. For information on where you can come and see us please view the Events, which is attached to the Contact button. 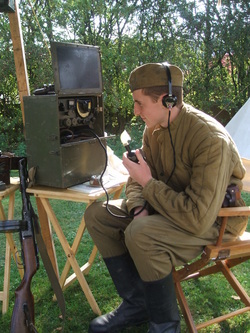 Members have previously taken part in film and TV documentary work and are available to undertake similar projects or for private or public World War Two themed events. If you would like the 13th Guards to attend an event, please contact the unit coordinator at the above Email for further information. Winner of the Jake Elliott Trophy, for best exhibitor under 18 years at the show, War & Peace Show 2008. Presented by the All-Russian Public Organisation for Veterans of the Armed Forces of the Russian Federation. For significant work in strengthening the friendship and cooperation between peoples of the Russian Federation and the countries of the Allied coalition. Presented by Chairman of the Council, General of the Army, B.Yermakov , Torgau, Germany 25 April 2015. B. Yermakov to unit members 25 April 2015. For participation in the commemoration of "70 years of the meeting on the Elbe" Torgau, Germany 25 April 2015. Presented by the All-Russian Public Organisation for Veterans of the Armed Forces of the Russian Federation. Under the Banner of Victory-70years, For participation in the commemoration of the 70th Anniversary of the meeting on the Elbe of soldiers of the Red Army and American Forces in April 1945. Torgau, Germany 25 April 2015. Presented by the Russian Public Organisation "Spirit of Elbe", Moscow in partnership with the Veterans Union. For participation at the 70th Anniversary commemorations Torgau, Germany 25 April 2015. Presented to members by Colonel Z. Vashurina, Head of "Spirit of Elbe" Organisation, Moscow. The 13th Guards endeavour to further promote the "Spirit of Elbe" organisation internationally.